Founded by Melanie Notkin, Savvy Auntie is the multi-platform lifestyle brand that empowers and engages aunts, serving the PANK demographic discovered and coined by Notkin, and heralded by fabulous kid-loving women everywhere as a modern celebration of Aunthood. Notkin launched SavvyAuntie.com in 2008 and it remains the first and only resource and online community for this demographic. 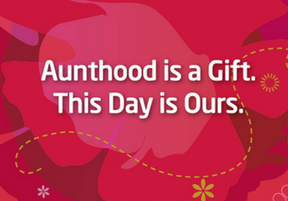 The brand also includes a popular and engaged social media following, Auntie’s Day – a national day founded by Notkin to honor aunts and godmothers, the Savvy Auntie Coolest Toy Awards and Melanie Notkin’s national bestseller: Savvy Auntie: The Ultimate Guide for Cool Aunts, Great-Aunts, Godmothers and all Women Who Love Kids (Morrow 2011). As a lifestyle expert, toy expert, and leading expert in the growing demographic of childless, of single women, Notkin appears on TV and as a spokesperson. For more information, visit: SavvyAuntie.com and MelanieNotkin.com.